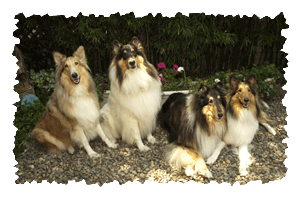 The most famous collie of all, Lassie, colors our impression of this breed, and many people who approach collie rescue had a memorable, Lassie-like collie for a childhood pet. Collies as a breed do share some common traits, yet they also come in a wide variety of personalities, shaped in part by their genes and in part by their upbringing The upbringing part is especially relevant for any dog coming from rescue, regardless of breed. hunting. The AKC purebred collie that we recognize today arose in the late 19th century from crosses between these farm collies and a sighthound breed, probably the Borzoi. This interbreeding accounts for their larger size than their farm dog relatives(the English shepherd, the border collie, the Australian (so-called) shepherd, the old English sheepdog, and the Shetland sheepdog), and their long narrow heads without a "stop". 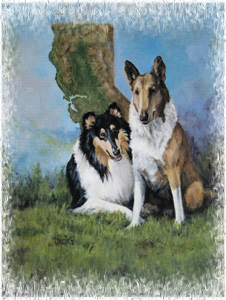 Since the turn of the 19th century, collies were no longer bred as working dogs, but rather as show dogs and affable family and companion dogs. This recent history produced, on average, a more mellow, easy-going dog that seems to have an instinctive love of children (if socialized properly to them, and sometimes even if not). As part of being a family dog, collies are usually a love-everyone kind of dog. They are in some ways independent, in that they are not usually loyal to one person but rather love everyone in the family...and all of their friends...and strangers on the street! For this reason, collies do not do well unless they can live in the house with their family. Our rescue, like most collie rescues, will only adopt a collie to be an indoor/outdoor dog. Collies should be housedogs but have access to the outdoors to run and exercise their large bodies. This usually means long walks with their human friends, or cavorts in the county if they are lucky enough to live an area where they can truly run. Most suburban backyards are not large enough, so they will also need their daily walk. Collies are not more, or less, intelligent than most other dogs, nor are they more or less stubborn or sensitive. Only a few breeds of dogs can be readily trained using correction or punishment based methods, and collies are not one of those breeds. Collies thrive with the modern, positive methods (click here for a website that summarizes the new training methods) that includes food and play and positive reinforcement for a job well done. Many collies trained in this way go on to be quite accomplished working dogs. If you are interested in putting your collie to work, check out the American Working Collie Association website. Generalities aside, collies come in a wide variety of personalities. Some are tightly wound, high energy dogs who will drive you nuts unless you give them a job. Others are mellow, low energy dogs who would far rather lie in the sun or roll in the grass than run around after a bunch of sheep. Quite a few collies love to bark...and bark...and bark...at everything. Others are more like ordinary dogs, only expressing themselves with alert barking or moderated communication (!) In addition, some collies can have a bark that is so high pitched and sharp that it sounds like it would break all the glass in the house. When that sharp bark is combined with a talkative dog, well, it s not pretty. Not a few collies have come into our rescue because their owners could no longer deal with the barking, and not a few come into rescue surgically debarked. Not all collies are good with children, and some collies can be quite predatory around cats and other small animals, despite the Lassie image of a gentle, wise, tolerant dog. As with most rescues, NCR works hard to evaluate each dog in a foster home before making a placement. We make an effort to test our collies with children, cats, and other dogs so that we can make the most compatible match between collie and prospective adopter.